Here we go again. Yet another attack on access to records — yet another assault on the right to the free flow of information. This time, it’s in Washington State, where the Department of Health wants to take records that are now public and readily accessible and close them. Washington is and has long been an open records state; birth, marriage, death and divorce records and many other types of genealogically-useful records are readily available for genealogical and other research. Now the Health Department wants to close them. If its proposal is accepted, birth records would be closed for 125 years, and all other vital records for 50 years. It isn’t going to the Legislature to effect this fundamental change in Washington State law. It isn’t going to the courts. No, all it has to do is convince a four-member committee called the State Records Committee whose members are appointed, not elected, that this falls within its power to “approve, modify or disapprove the recommendations on retention schedules of all files of public records and to act upon requests to destroy any public records” under §40.14.050 of the Revised Code of Washington. 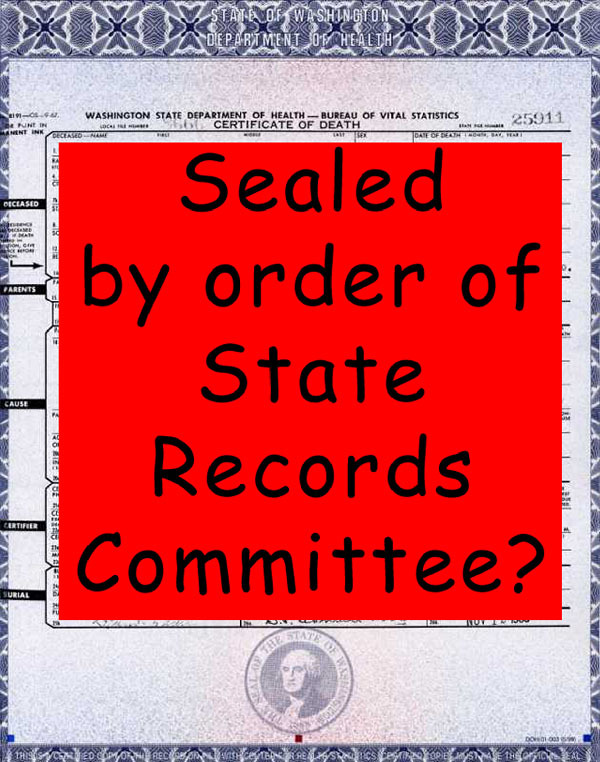 The committee itself is made up, by that same statute, of “the archivist, an appointee of the state auditor, an appointee of the attorney general, and an appointee of the director of financial management,” and under § 434-624-040 of the Washington Administrative Code, it can act on records retention, disposition or destruction by a simple majority vote. What’s particularly frightening about this is that there wasn’t any big public announcement by the Washington Department of Health about this — no news release to the public and media. (The Department’s press releases are online; not one word of this is in the news releases.) Do a web search for any combination of words — and you won’t find any reference to this on any of the state websites. Now obviously the word is out, and there isn’t any deliberate attempt to make sure this sneaks past without public comment — but it sure points out that there isn’t any particular emphasis on making sure the public knows when its public right to know is being threatened. So… what do we do about this? The Washington State Department of Health has sent a request to the Public Records Committee that all WA Vital Records have limited access: births for 125 years, marriage, death & divorce to 50 years. This is devastating news to genealogists as well as other businesses and industries that use these records for legitimate purposes. The Public Records Committee will meet 5 December 2012 at 10 am at the State Archives in Olympia to hear the request and make a decision. The committee is comprised of four members who represent the offices of the Attorney General, State Auditor, and Governor. The State Archivist also sits on this committee. 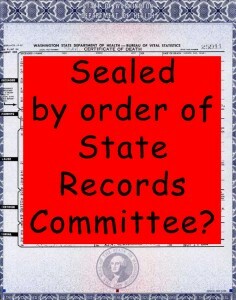 This committee has the authority to restrict records without legislative approval. We all know that this is a knee-jerk reaction to the uninformed public’s panic attack over identity theft. In the exhaustive numbers of research reports open public vital records have never been pointed to as a contributing cause of identity theft. The chances of getting caught are much higher if a criminal uses legitimate channels. It actually is more time consuming and expensive for thieves to use vital records for identity theft. It is much easier to steal someone’s credit card number when you buy goods and services at a store or restaurant. On 8 October 2012 an article in the New York Times points out many issues that many businesses and government agencies are having with the new restrictions to the Social Security Death Index. The article also points out that the financial industry is having a harder time protecting against identity theft with the new restrictions. To try and stop this train wreck, we need to send letters to our legislatures, newspapers, and members of the PRC. An information packet will be forthcoming explaining how to write a letter to a public official, facts about identity theft and open public records, a sample letter, and a list of public officials with emails and snail mails. We also need to get a contingent of people to “storm the gates” and attend the meeting to let your voice be heard. • Speak up!! Work with the Washington State Genealogical Society and other concerned groups to target legislators and other public officials and to educate the news media about this issue. If you live in Washington, contact your legislators. If you have kin from Washington State, contact the legislators from the area where your family lived. If you have kin now living in Washington State, work with them to contact their legislators. There’s a Find Your Legislator feature at the Washington State Legislature website that will help you identify the legislators you want. That site also has specific information about the State House of Representatives and about the State Senate. Complicating matters a little is the fact that, like everybody else, Washington just had elections and some of the people now in the legislature may not be returning in January. So once you identify a legislator you want to write to, it’d probably be worth a quick web search to make sure that person wasn’t defeated in the election this week. Now writing to a legislator doesn’t mean taking a sample letter, adding your name to it and sending it off. A legislator isn’t going to be impressed by 50 copies of the same letter. An individually-tailored letter with your individual reasons why you’re concerned and want these records kept open is the only way to go. • Turn out!! Again, work with the Washington State Genealogical Society and other concerned groups to make sure that committee room is packed on December 5th. If there’s no evidence that the public cares about its right to know, there’s no reason to believe the committee will care either. We’re not talking about an unruly mob here. We’re talking about a serious group of researchers who want to make their voices heard, respectfully but firmly. In the end, preserving public access to public records is up to us. If we don’t speak out, we will lose. It’s really as simple as that. Might be a good time for the Society to kick off a public petition on this matter. I think it really helped on the recent Georgia Archives issue. It’s a sure bet I’d sign it, Mike! I agree – as a fellow genealogist I’d sign a petition as well and make sure to get that info to my fellow researchers. If the WSGS sets one up, Sandy, I’ll be sure to announce it. We say this to each other way to often……. That we do, Skip. That we do. This isn’t a proposal to charge a fee, Patrick: it’s a proposal to close the records altogether for many many years. I had a chance to chat with some Washington genealogists at the Salt Lake Institute of Genealogy. I’m informed there was no movement to close the records… but that the archivist (a real friend to the genealogical community) has been replaced by a political appointee. So it’s a good-news-bad-news situation.